Ultrasonic Testing (UT) of different tubes is a commonly used method for inspection. Various techniques are employed for tube examination. However, sometimes the results of the inspection are not satisfactory due to different reasons such as, insufficient sensitivity, inability to size the flaws, low reliability, and so on. The objective of this paper is to describe the abilities of a few "non-conventional" UT techniques (i.e. techniques which are not commonly used) detecting and measuring flaws located on the tube inner surface, tube outer surface or within the tube wall. We assume that tube can be filled with water and access is possible only from within the tube. Typically the pulse-echo (PE) and pitch-catch (PC) techniques are used for tube testing. Normal beam longitudinal waves and angle beam shear waves are commonly employed. Each technique has its advantages and deficiencies. For example, the angle shear wave PE method provides good sensitivity at the detection of small flaws, which clearly appear on the B- and C-images as the reflected responses with significant peak amplitude. When there is no flaw, no reflected signal returns to the transducer. However, this technique cannot be used to measure the depth of shallow flaws, because for a shear wave propagated at an angle within the tube wall only signal reflected from the flaw corner has sufficient amplitude, and the diffraction signal from the flaw tip is very weak. The circumferential and axial PC methods using shear waves propagating at angle within the tube wall often provide more accurate and reliable depth measurement of shallow flaws. In these techniques the flaws are flagged, first of all, as the signal amplitude drops relative to the signal typically reflected from the tube outer diameter (OD) and inner diameter (ID). This is because the PC signal is partially blocked and reflected from the flaw. Secondly, the peaks of PE responses may appear due to the signal reflected directly from the flaw. As a result, the shear wave circumferential and axial PC techniques are widely used for flaw depth measurement. However, they can only be readily employed for inspection of tubes with large ID, since there should be enough room inside the tube to place two UT transducers circumferentially or axially at angle to tube inner surface. That is why shear wave PC techniques are not commonly used to test tubes with small ID. However this problem can be solved using an axially positioned small transducer with a special two-step acoustic mirror. This mirror allows exciting two skips of shear wave inside the tube wall (by reflecting beam from transducer to tube ID at an specific angle) and receiving the wave going out from the tube wall (by reflecting beam to the same transducer at the an specific angle). The simulation of acoustic beams transmitted from the transducer, reflected from 1st step of the mirror, refracted in the tube wall, reflected from 2nd step of the mirror, and received by the same transducer, performed using "Imagine-3D" software is presented in Fig. 1. Fig 1: "Imagine-3D' simulation of the acoustic beams transmitted, reflected, refracted, again reflected, and received by transducer. The "quasi-PC" mode shown in Fig. 1 allows using only one transducer and a two-step mirror to obtain the PE and the "quasi-PC" responses. The configuration shown in Fig. 1 provides rather high amplitude and sensitivity of "quasi-PC" responses. The two-step mirror, fitting standard PE axially positioned probe case and providing an appropriate "quasi-PC" signal, was designed and manufactured. The experiments to test the "quasi-PC" technique were performed using different transducers, mirrors and tubes. The measurements were done in the PE mode in an immersion tank using a computerized scanning rig with UT system. The rig allowed motion in four dimensions: three linear with 0.1mm accuracy and one rotary with 0.20 accuracy. Transducer with mirror was oriented axially and located in water inside the tube, which was positioned on the scanning rig turntable. UTEX UT-340 Pulser-receiver, SONIX STR-8100 digitizer card, and WINSPECT software were employed for the experiments. The tests were performed using different tubes with various ID and OD notches. The axially positioned probe with an aperture 4.6mm in diameter, center frequency 15MHz, and focal length 15mm was used. Applying this transducer and the designed two-step mirror, a section of steel tube with ID=11mm, OD=13mm, and seven OD circumferential rectangular notches was examined. The corresponding axial B-scan performed along the tube axial axis is shown in Fig. 2. Fig 2: Axial B-scan of seven circumferential OD rectangular notches 0.05mm, 0.1mm, 0.2mm, 0.3mm, 0.4mm, 0.5mm, and 0.6mm) deep and 0.15mm wide in PE and quasi-PC modes. Probe: shear wave angle beam transducer (diameter 4.6mm, center frequency 15MHz, focal length 15mm) with two-step mirror. Graph on the left of B-scan shows the axial amplitude distribution for quasi-PC response. The figure 2 shows the B-scan image with axial "quasi-PC" and axial PE responses, coming at different time. The amplitude drops of PC responses from OD notches correspond to the amplitude peaks of the PE responses of these notches. Similar scans were obtained on other tube samples with various ID and OD notches. Note that numerous vertical lines represent the various mode-converted signals reflected from the ID, OD, mirrors, transducer holder, and so on. The results show that in order to increase the accuracy, sensitivity and reliability of flaw detection and sizing in tubes with small diameter, the "quasi-PC" mode of operation can be successfully employed. As it was mentioned already in section 2, the standard PE technique cannot be used for accurately measuring depth of the shallow flaw, since the diffraction signal from a flaw tip is very weak. To solve the problem of shallow flaw depth measurement in the PE mode, the following technique can be used. If one could excite within the tube wall a shear wave propagating tangentially with respect to the tube inner surface, than even a shallow radial flaw (notch, pit or crack) located at the ID would be a good reflector for such an ultrasonic beam since it would block the beam to the maximum extent. Any other technique will give a worse reflection. To create such acoustic beam one should use transducer located at a radial offset and oriented at an angle to the tube ID in order to obtain a large incident angle for the beam to enter the tube and, respectively, the refraction angle 900. After refraction at the ID, the beam reflects from the OD and propagates almost tangentially to the ID (see "Imagine-3D" simulation in Fig. 3a). Any shallow ID flaw will reflect the ultrasonic beam. Time and angle range of the obtained PE response (the response time duration in microseconds and response angle length in degrees, say, at -20dB level from maximum) should depend on the flaw depth. Note that the UT beam propagating at large refraction angle and consequently impinging the OD at large angle will be also reflected by shallow OD flaw or shallow flaw located within the tube wall. As a result, such flaw can be easily detected and accurately sized. Fig 3a: "Imagine-3D" simulation of the ideal tangential PE acoustic beam technique. Experiments to test the proposed PE tangential beam technique were performed using different transducers and tubes. The measurements were done in the PE mode in a water tank employing the computerized scanning rig with UT system. Probe was located in water inside the tube positioned on the scanning rig turntable. The transducer was located at a radial offset and oriented at an angle to the tube ID in order to excite the required shear wave within the tube wall. The tests were performed on the tube samples with various ID and OD notches (rectangular, segment and triangular) and tube samples with different fatigue cracks. The circumferentially positioned probes with aperture diameter 9.5mm, center frequencies 15-25MHz, and focal lengths 33mm and 41mm, water-paths 6-8mm, radial offsets 10-16mm, and incident angles 36-380 were used for testing. Applying these transducers, the sections of various ZrNb tubes with ID=103.4mm, OD=111.6mm, and WT=4.1mm with different fatigue cracks, rectangular, segment, and V-notches were examined. Note that, unfortunately, the real acoustic beam employed for experiments was not, of course, the strictly tangential, because any probe transmits rather wide beam converging before and diverging after the focal point, hitting the curved ID at different incident angles. The beam refracts at various angles on this ID surface, and reflects at different angles on the curved OD surface. The achieved "quasi-tangential" inspection technique for available transducer is shown in Fig. 3b. Fig 3b: "Imagine-3D" simulation of the achieved "quazi-tangential" PE acoustic beam technique for available transducer with diameter 9.5mm, center frequency 20MHz and focal length 33mm in water. The obtained result (Fig. 3b) is far from the desired one, presented in Fig. 3a. As one can see, the spherically focused ultrasonic beam created by the available transducer cannot, unfortunately, be properly focused on the ID or OD flaw. To realize the desired tangential beam technique, one should employ some high-frequency transducer with a stretched focal zone, e.g. the long-focused probe or transducer with logarithmic acoustic lens forming a narrow weakly diverging UT beam. However such transducers were not available in these experiments. Since the employed acoustic beam was not really tangential, the proposed method was not properly tested. Subsequently, the obtained results did not represent the full potential of the tangential beam technique. However in general the experimental data confirmed the results of the theoretical analysis. Figures 4-5 present typical circumferential B-scans of the sample tubes with various segment and rectangular axial ID notches. 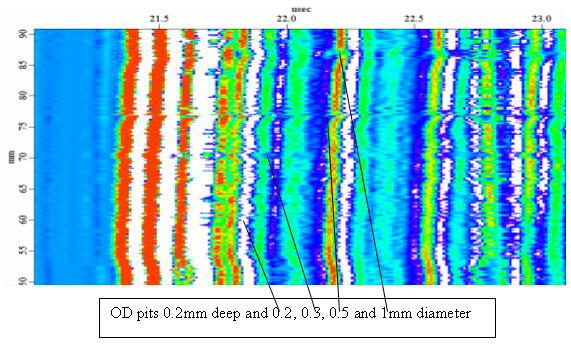 Fig 4: Shear wave circumferential PE B-scans of three ID axial segment notches with different depths in tube #18. Probe: center frequency 20MHz, focal length 33mm, aperture 9.5mm, water-path 8mm, incident angle 380. Color scale is shown in Fig.2. Fig 5: Shear wave circumferential PE B-scans of three ID axial rectangular notches 0.5mm wide with different depths in tube #39. Probe: center frequency 20MHz, focal length 41mm, aperture 9.5mm, water-path 8mm, incident angle 380. Color scale is shown in Fig.2. The analogous circumferential B-scans were performed on the tube samples with various triangular notches and V-notches and tube samples with different fatigue cracks. The results were very similar to the ones presented in Figs. 4-5. Using the obtained scans, the angle and time ranges for each response were measured at the level -20dB from the maximum amplitude value. Then the results were plotted vs. notch or crack depths. Some typical results are presented in Figs. 6-11. Fig 6: Time and angle ranges of circumferential PE responses from axial ID segment notches in tube #18 vs. notch depths. Probe: center frequency 25MHz, focal length 41mm, aperture 9.5mm, water-path 8mm, incident angle 380. Fig 7: Time and angle ranges of circumferential PE responses from axial ID rectangular notches 0.5mm wide in tube #39 and 0.15mm wide in tube #40 vs. notch depths. Probe: frequency 20MHz, focal length 33mm, aperture 9.5mm, water-path 7mm, incident angle 370. Fig 8: Time and angle ranges of circumferential PE responses from axial ID triangular notches 900/450 in tube #10 vs. notch depth. Probe: frequency 20MHz, focal length 33mm, aperture 9.5mm, water-path 7mm, incident angle 370. 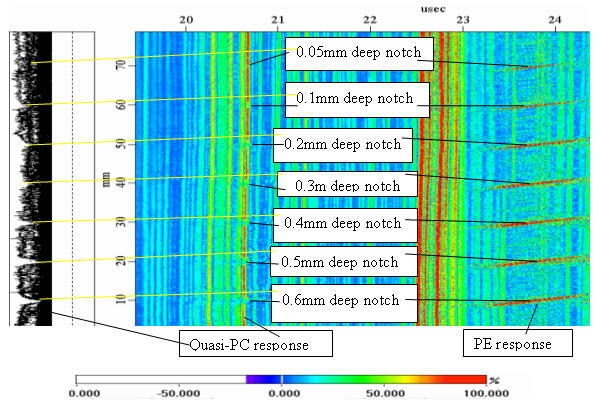 Fig 9: Time and angle ranges of circumferential PE responses from axial ID 300 V-notches in tube #22 vs. notch depth. Probe: frequency 20MHz, focal length 33mm, aperture 9.5mm, water-path 8mm, incident angle 380. Fig 10: Time and angle ranges of circumferential PE responses from ID fatigue cracks grown on ID in tubes ##29-34 vs. crack depth. Probe: frequency 15MHz, focal length 33mm, aperture 9.5mm, water-path 6mm, incident angle 360. 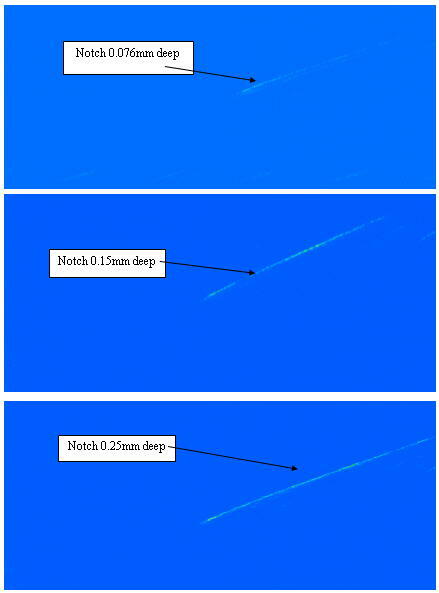 Fig 11: Time and angle ranges of circumferential PE responses from fatigue cracks grown on ID from the root of rectangular notch at its edge corner in tubes ##35-38 vs. crack depth. Probe: frequency 15MHz, focal length 33mm, aperture 9.5mm, water-path 6mm, incident angle 360. Both curves in Figs. 6-11 demonstrate pretty good correlation between the measurement results and the ID notch/crack depths. Moreover, the obtained results showed that the response range weakly depends on the flaw width and even on the flaw shape, providing that similar inspection conditions were used during testing (type of the transducer, its position in water inside the tube, pulser-receiver and digitizer card settings, etc). As a result, one can conclude that tangential beam technique in the PE mode is approximately the flaw width- and shape-independent, but strongly depends on the flaw depth. From physical point of view it happens because flaw reflectivity of the acoustic tangential beam depends almost solely on the flaw depth and very weakly on its shape and width. Recall that real acoustic beam used for testing was not strictly tangential, and this created some additional errors and led to the performance deterioration and mismatch with theory. Besides the ZrNb tubes with ID=103.4mm and WT=4.1mm, the small steel tubes with ID=11mm and WT=1mm were examined to test the proposed PE tangential beam technique. The axially positioned probe with aperture diameter 4.6mm, center frequency 15MHz, focal length 15mm, water-path 12mm, and incident angle 20.50 was used for testing. Applying this transducer with attached axial 450 flat mirror the sections of steel calibration tube with seven OD circumferential rectangular notches were inspected. Note that even the small OD flaws examined not at 900, but just at large incident angle (about 700 in our case), can be detected and sized rather accurately. Fig. 12 presents typical axial B-scans of the calibration steel tube with various circumferential rectangular OD notches. 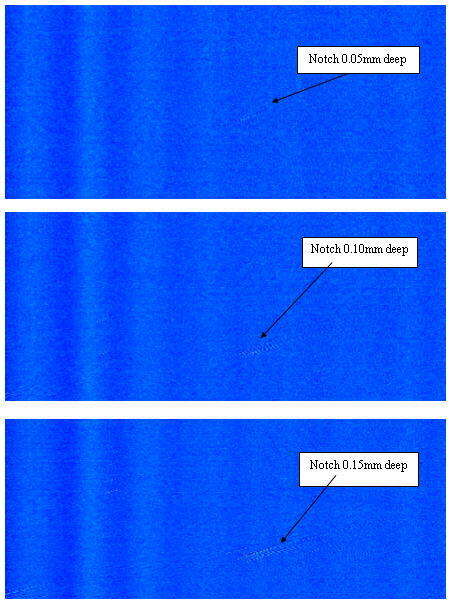 Fig 12: Shear wave axial PE B-scans of seven circumferential OD rectangular notches 0.15mm wide with different depths in calibration steel tube. Probe: center frequency 15MHz, focal length 15mm, aperture 4.6mm, water-path 12mm, and incident angle 20.50. Color scale is shown in Fig.2. The analogous axial B-scans were performed on the tube samples with various ID and OD notches and pits. The results were very similar to the ones presented in Fig. 12. Using the obtained scans, the axial and time ranges for each response were measured at the level -20dB from the maximum amplitude value. Then the data were plotted vs. notch depths. Some typical results are presented in Figs. 13. 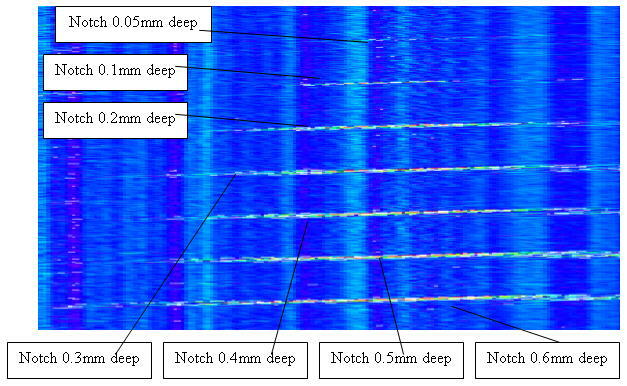 Fig 13: Time and axial ranges of axial PE responses from circumferential OD rectangular notches in steel calibration tube vs. notch depth. Probe: frequency 15MHz, focal length 15mm, aperture 4.6mm, water-path 12mm, incident angle 20.50. The normal beam longitudinal waves are commonly employed for tube inspection in the PE mode. However, in order to provide a 100% volumetric coverage in circumferential direction, the transducer or acoustic mirror, which sometimes is attached to the probe to reflect the UT beam from transducer to the tube ID and back, should be mechanically rotated. The necessity of such a rotation significantly complicates the inspection system and decreases its reliability and sensitivity due to mechanical vibrations, radial shifts, possible jams, electromagnetic interference, and so on. The possibility to get rid of the rotation is extremely attractive, since it will greatly simplify the whole inspection system (no bearings, slip rings, etc) and improve its performance and reliability. Various attempts were made to develop the UT system for tube inspection without mechanical rotation. One of the most typical solutions is to apply a circular phased array instead of a single transducer. At the time being some industrial companies develop and manufacture the UT inspection systems with phased arrays for tube testing. Of course, phased array has very significant advantages: high lateral azimuthal resolution due to interference of the acoustic waves from different piezoelements; high axial resolution due to dynamic focusing; electronic steering of the UT beam instead of mechanical one; high scanning speed; and decrease in labor cost during the inspection. On the other hand, the circular array for tube inspection has a number of serious disadvantages: poorer resolution in circumferential direction and low energy efficiency and sensitivity since in a circular array only a few circumferentially positioned piezoelements can simultaneously participate in signal formation; standard rather low axial resolution since focusing in this direction is performed only by cylindrical acoustic lens; complex and expensive circuitry; low signal-to-noise ratio because of the inhomogeneity of small piezoelements, crosstalk between them, significant width vibrations, and waves from the piezoelements ends; high cost; special complex pulser-receiver; and so on. The other idea was to apply the Lamb guided wave propagating within the tube in circumferential direction. The properly oriented angle transducer, located inside the tube in water, can excite such a wave. However, since this wave is not focused and propagates circumferentially along the whole tube, the sensitivity of this technique to some small local flaw is rather low. Moreover, during its propagation within the tube wall the Lamb guided wave permanently leaks into water filling the tube. The only way to receive the Lamb guided wave propagating within the tube wall by using transducer, located inside the tube in water, is to receive this leaky wave. Since the leaky wave is very weak, the amplitude of the received signal will be rather small. As a result, the total sensitivity of the Lamb guided wave method to flaw detection (not to speak of flaw sizing) is very low. Theoretically, the Rayleigh (surface) wave propagating circumferentially along the whole tube can be used for testing. The angle transducer, located inside the tube in water and oriented to the tube ID at angle greater than second critical but less than third critical, can excite such a wave. However, first of all, this wave can be excited only on the tube inner surface, and secondly, such technique will have disadvantages similar to ones of the Lamb guided wave method. Actually, both techniques are the "integral" ones and have low sensitivity to any "local" flaw detection. Besides these, there are some other ideas regarding the UT system for tube inspection without mechanical rotation. 4.1	Conical mirror One of these ideas is to use the axially positioned transducer with a conical mirror in the PE mode. The UT beam from the conical mirror impinges simultaneously the whole inner surface of the tube along the circle (see "Imagine-3D" simulation in Fig. 14). As a result, the whole tube in circumferential direction can be examined simultaneously. The beam reflected from the tube will return to the transducer. Fig 14: "Imagine-3D" simulation of the transmitted, reflected, and refracted acoustic beams from axially positioned normal beam probe with conical mirror. However, the sensitivity of such a probe is naturally much less than that of a standard normal beam probe, since standard transducers concentrate all UT energy in one point, while probe with the conical mirror distributes energy along the whole circle. Comparing the areas of UT beam spots of the standard transducer and the probe with conical mirror, one can obtain that, depending on the transducer parameters and tube dimensions, the sensitivity of probe with conical mirror should be 10-1000 times (20-60dB) less. That is the main disadvantage of transducer with conical mirror and the price for an ability to get rid of mechanical rotation. Note that since transducer with conical mirror transmits and receives UT signals in all directions (field of view is equal to 3600), its response in reception mode represents the integral signal reflected from the whole circle. So, if there is a response from some "local" flaw, its amplitude is rather small in relation to the total signal amplitude, and it is impossible to determine its circumferential coordinate. In order to measure this coordinate, probe with conical mirror should be positioned eccentrically to the tube (i.e. at some radial offset). As a result, responses from the tube areas with different circumferential coordinates will have different time-of-flight. Measuring time-of-flight of the flaw response, one can determine the circumferential coordinate of this flaw, provided that position of the probe relative to the tube axis is known accurately. A conical mirror shown in Fig. 14 was designed and manufactured from stainless steel. In order to minimize the blocked area of the acoustic field, mirror and transducer holders were connected by three thin strong rods The experimental tests to evaluate capabilities of the UT probe with this mirror were performed on flaws such as OD flat-bottom holes and OD axial notches. All flaws had different depths and widths. The measurements were done in the PE mode in a water tank employing the computerized scanning rig with UT system. Probe was located axially in water inside the tube positioned on the scanning rig turntable. The tests were performed on samples of steel tube with ID=11mm, OD=13mm, and WT=1mm. A typical result is presented in Fig. 15. Fig 15: Axial PE B-scan of four OD flat-bottom holes 0.2mm deep and 0.2, 0.3, 0.5, and 1mm diameter in PE mode. Probe: normal beam transducer (diameter 4.1mm, center frequency 20MHz, focal length 20mm) with conical mirror. Color scale is given in Fig. 2. Similar results were obtained on the other tube samples with various ID and OD notches. Note that various vertical lines represent different mode-converted signals reflected from the ID, OD, mirror, transducer holder, and so on. The performed experiments show that despite the low sensitivity, the transducer with conical mirror can detect different and even rather small flaws. One more idea, how to inspect the tube without mechanical rotation, is based on the shear wave multi-skip technique. Transducer working in PE mode and placed inside the tube in water at radial offset and oriented to the tube radius at incident angle greater than first critical but less than second critical, will excite the shear wave propagating within the tube wall at an angle to the tube ID. Such a wave during its propagation will be reflected many times from the tube ID and OD. As a result, significant portion of the tube wall will be tested by this wave. If there is no flaw on the wave path, no reflected signal returns to the probe. If there is a flaw (on the ID, OD or inside the tube material), the PE response will come back to the transducer. "Imagine-3D" simulation of this technique is presented in Fig. 16. Fig 16: "Imagine-3D" simulation of the shear wave multi-skip technique for transducer with diameter 6.35mm, center frequency 10MHz, and focal length 50mm. As shown in the simulation, the initial longitudinal wave in water transmitted by the probe and impinging the tube ID at angle (red rays in Fig.16) will be reflected (blue rays in Fig.16) and go to the other area of the tube, where it will create the another shear wave propagating at angle within the tube wall. Subsequently, the second region of the tube will be tested similar to the first area. But because of the new reflection at the interface water/tube in the area of second region of the tube, the longitudinal wave in water will be reflected (purple rays in Fig.16) and go to the third area of the tube, where it will again create the shear wave propagating at angle within the tube wall. As a result, the third region of the tube will be tested similar to the first and second areas. By choosing the proper transducer orientation and placement, the whole tube along its circumference can be covered. The experiments to test the proposed shear wave multi-skip technique were performed using different transducers. The measurements were done in the PE mode in the water tank employing the computerized scanning rig with UT system. Probe was located circumferentially in water inside the tube positioned on the scanning rig turntable. Transducer was placed at radial offset and oriented at angle to the tube ID in order to excite the required shear waves within the tube wall and the reflected longitudinal waves in water. The tests were performed on the sample of ZrNb tube with ID=103.4mm, OD=111.6mm, and WT=4.1mm with one axial rectangular ID notch 2.54mm wide and 0.5mm deep. Various probes, spherically and cylindrically focused, with diameters 6.35-9.5mm, center frequencies 5-15MHz, and focal lengths 20-60mm were used for testing. During the experiments the tube was rotated in order to obtain the PE response of the notch at its different rotary positions regarding transducer. Typical circumferential B-scans of the sample tube with rectangular axial ID notch are shown in Figs. 17-18. Fig 17: Circumferential PE B-scan of axial rectangular ID notch 0.5mm deep and 2.54mm wide in PE mode. Probe: diameter 9.5mm, center frequency 10MHz, focal length 50mm spherical, water-path 22mm, radial offset 13mm, incident angle 360. Color scale is given in Fig. 2. Fig 18: Circumferential PE B-scan of axial rectangular ID notch 0.5mm deep and 2.54mm wide in PE mode. Probe: 6.35x18mm, center frequency 5MHz, focal length 19mm cylindrical, water-path 22mm, radial offset 15mm, incident angle 380. Color scale is given in Fig. 2. The analogous circumferential PE B-scans were performed on this tube sample using various transducers. The results were similar to the ones presented in Figs. 16-19. As one can see, all four Figs. 16-19 obtained by using various probes have three clear responses oriented at angle. These responses represent three groups of shear waves generated within the tube wall in three different areas of the tube and reflected from the notch (see Fig. 15). Two vertical responses located at 30 s and 350 s represent the longitudinal waves in water, which were diffusely reflected back to the probe from the tube ID (directly and after multiple reflections in water inside the tube). Thus, the immovable transducer working in the PE mode can detect the notch located at any angle within the range from 00 to 3600. The position of the notch response will be, depending on the rotary coordinate of notch and, respectively, the response time-of-flight, somewhere on one of three straight lines oriented at angle. In order to improve the results presented in Figs. 16-19 (i.e. to make the reflections from the notch stronger and more uniform, and to get rid from the "acoustic noise" - the diffuse ID reflections) one should use the special transducer with required focal length, diameter and center frequency, designed specifically for this application. Of course, these parameters of the transducer should depend on the tube size. Unfortunately, for the tested ZrNb tube the desired probe was not available. Evaluating deficiencies of the proposed technique, it is necessary to note the following. First of all, since the longitudinal wave in water and the shear wave inside the tube wall pass the long way, the applied transducer should be long-focused or have a logarithmic lens with a stretched focal zone in order to diminish the divergence of the acoustic beam and increase its intensity. Secondly, to prevent the appearance of mode-converted longitudinal waves inside the tube wall during the shear wave reflections, and respectively the loss of energy, the shear wave should impinge the ID and OD at the incident angle greater than critical angle of reflection, which in this case is equal to 300 (it follows from the Snell's law for mode converted reflected wave). Thirdly, at each impingement at the ID the shear wave propagating inside the tube wall loses some energy because of the longitudinal wave transmitted into water. In general, the obtained results show that shear wave multi-skip technique can be used to detect the flaw located on the ID, OD or within the material at any rotary coordinate without rotation. The circumferential position of the flaw should be determined by measuring time-of-flight of the obtained PE response. Thus, the shear wave multi-skip technique can be successfully used to inspect the tube without mechanical rotation. Various approaches to the problem of accurate and reliable UT testing of the tubes were investigated. To increase the accuracy, sensitivity and reliability of flaw sizing, the "quasi-PC" mode of operation can be employed for the small diameter tube testing. This technique employs transducer working in the PE mode and a two-step acoustic mirror, which allows exciting the shear wave inside the tube wall (by reflecting the beam from transducer to the tube ID at the required angle) and receiving the wave going out from the tube wall (by reflecting the beam to the same transducer at the required angle). The tangential beam technique in the PE mode can be used to accurately measure depths of the shallow ID, OD or internal flaws. This method is based on the excitation of the shear wave propagating within the tube wall tangentially to the tube ID. As a result, even the shallow radial flaw (notch, pit or crack) located at the ID, OD or within the tube wall is a good reflector for such UT beam, since it blocks the beam to the maximum extent. Any other technique gives a worse reflection. Tangential beam method provides good (almost linear) correlation between the measurement data and the flaw actual depths. The results show that the tangential beam technique is the almost flaw shape- and width-independent. The axially positioned normal beam transducer with conical mirror in the PE mode can be used to inspect the tubes without mechanical rotation. The UT beam from probe reflects from the conical mirror and impinges simultaneously the whole inner surface of the tube along the circle. As a result, the whole tube in the circumferential direction is examined simultaneously. The beam reflected from the tube returns to the conical mirror and than to the transducer. However, the sensitivity of such a probe is much less than that of the standard normal beam probe, since the standard transducer concentrates all the UT energy in one spot, while probe with conical mirror distributes the energy along the whole circle. The performed experiments showed that despite the low sensitivity, such transducer could detect different and even rather small flaws. The shear wave multi-skip technique allows inspecting the tubes without mechanical rotation. Transducer, working in the PE mode and placed inside the tube in water at radial offset and oriented at angle to the tube ID, excites the shear wave propagating within the tube wall at angle to the tube radius. Such a wave during its propagation will be reflected many times from the tube ID and OD. As a result, a significant portion of the tube wall will be tested by this wave. The other portions of the tube will be tested by similar groups of shear waves generated by the longitudinal waves reflected in water from the tube ID. It means that this technique can be used to detect the flaw located on the ID, OD or within the material at any rotary coordinate without rotation. The circumferential position of the flaw should be determined by measuring time-of-flight of the obtained PE response.